I thought I'd change my weekly 'Last Week's Writing Inspiration' post to Monday Muse. It has a nicer ring to it and is shorter to type! On Monday's I'll be posting whatever inspired me the week prior, in hopes that maybe it can inspire you! Last week my muse drew power from this picture. 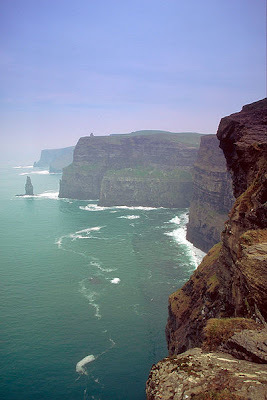 These are the cliffs of Mohr in Ireland. I've had this picture stuck away for some time and was saving it for when I reached this stage in my book. The moment I saw this picture I knew I had to write about this place. It hit me on a visceral level. I started researching the cliffs immediately. The more I found out the more fascinated I became, and the richer my story became! I posted it a while back when I first found it but now that I'm at this point in my book I just had to post it again! As for ear candy last week, my muse has been snacking on a lot of Irish music and Loreena McKennitt! OMG, This picture is nearly (note my usage there *wink*) beyond words! Amazing, thanks for sharing. I know huh?! When I saw it I knew I had to share it. It's too amazing not to.